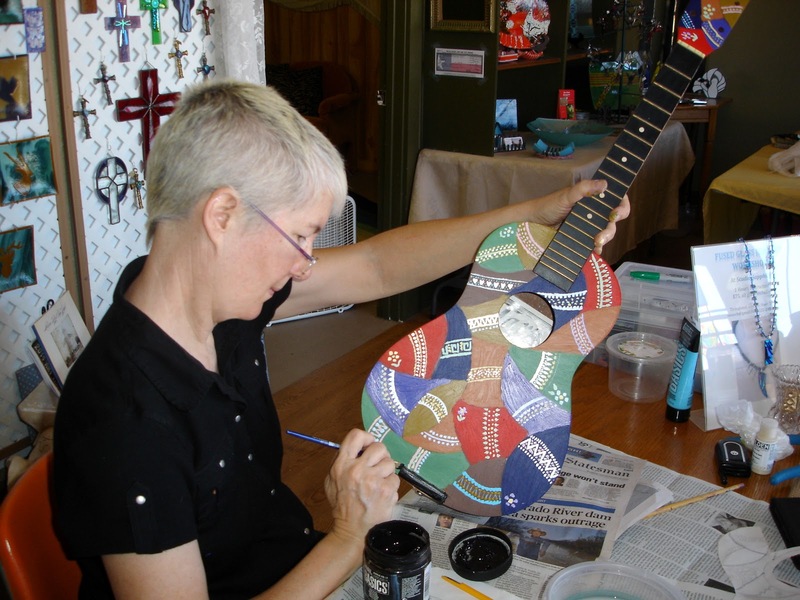 Our member Cherie has an old Tara Baritone Ukulele. The top didn't have sufficient bracing inside to support the bridge, so the tension of the strings was warping the face of the instrument. Don removed the bridge and fabricated a tailpiece to secure the strings. The original bridge was glued and screwed so removing it damaged the first layer of plywood which he repaired with sawdust and superglue. He made a floating bridge and replaced the original tuners. I wanted to make it look a LOT better, so I asked my friend Sheri if I could use some of her acrylic paints and borrow her shop for the day. It's been 40 years since I painted anything so it was a bit nerve-wracking at first but as soon as I started it went pretty well. Once the paint was dry, I applied a couple of coats of polycrylic, Don restrung it and it's an attractive, playable instrument.